Dubai, UAE, April 08, 2019: It’s every woman’s dream to be able to get rid of wrinkles, pores, a dull and uneven complexion and imperfections of all kinds. In our ultra-digital age and with the rise of social networks that accentuate the importance of how we look, women are more concerned than ever about their image. Whether it’s about taking temporary corrective measures or simply learning new tricks, women are prepared to go to great lengths to get their dream complexion. Today, being natural has become more appealing to more and more women of all generations. #fake and #temporary are things of the past as women do not want to cheat any longer. 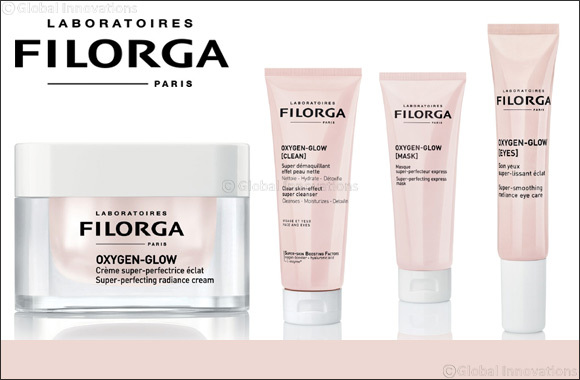 Because perfect skin doesn’t mean camouflaging flaws, because successful selfies don’t necessarily require special effects, and because wanting to be real doesn’t have to be a pipe dream, FILORGA has launched OXYGEN-GLOW, the 1st #NOFILTERSKIN range for perfect skin in any type of lighting, and with no cheating! No more trickery or fake faces, beautiful skin in real life is now possible! These super-powerful products are able to work simultaneously in every detail required to create genuinely perfect skin! The Oxygen-Glow Revolution allows for double perfection #nofilterskin thanks to its intensive flawless skin action by super skin boosting factors including Energising Oxygen-Booster, smoothing and plumping Hyaluronic Acid and Detoxifying L-Enzyme. Based on a high-tech formulation, this unique technology, which gives the formulas their pink appearance, contains a combination of optical soft-focus creators and brightening pearlescent particles, carefully measured to instantly reveal beautiful and natural skin in any type of lighting. This is a “miracle” cream that transforms the skin in real time! Enriched with a colour-control peptide for even greater unifying effectiveness. With its hydra-glow melting cream texture, the skin is instantly enhanced, dazzling with radiance! This eye contour care, suitable for sensitive skin, smoothes and revives in the blink of an eye! Enriched with decongestant tetrapeptide for enhanced anti-dark circle effectiveness. It is a highlighter with a cream-gel texture. Eyes are left refreshed, eye contour hydrated and detoxified, as though it is surrounded by a halo of light! This super-perfecting mask works wonders in just 10 minutes! Enriched with a trio of peeling active ingredients (gluconolactone + grapefruit extract + papaya) for even more fast-acting effectiveness. With a cream mask texture and metallic shimmer, each application results in a radiant and even complexion. It can also be used each evening for a 7-day intensive treatment for a super-perfecting effect. A super make-up remover that instantly detoxifies skin! Enriched with high-performance cleansing agents for enhanced anti-impurity effectiveness, this sparkling and transforming gel texture protects the skin effectively against urban pollution and fine particles. It leaves skin perfectly clean and better equipped for daily defence. Filorga’s OXYGEN-GLOW range is available for purchase at leading pharmacies including Bin Sina Pharmacies, Boots Pharmacies, Planet Pharmacies, Health First Pharmacies and Community Pharmacies.